Burning with desire to promote Filipino culture in the world through Pinoy games, a group of Filipinos created SIPA, street hacky sack, for Apple iTunes and Android Market. With more than 500,000 apps in iTunes alone, there is hardly a Pinoy-themed game that people can play. This became a challenge for the group. The group also known as Team Butchukoy, is a group of mavericks but really they are sentimental and nationalistic at heart. They may look apathetic but their concern for the country is genuine. In fact, this is not their first endeavor in an effort to improve Filipinos’ love for country – but this is the most fun!!! As much as they love to play mobile games and they have their favorites, they could not get over the fact that something was amiss. They know Filipinos are very talented but somehow no one has thought of a Pinoy-themed game. Thus, the start of their determination to create one. What game should be created? The brainstorming came to a point where suddenly they missed games they used to play as kids – street games like tumbang preso, luksong tinik, taguan, sipa, piko, habulan, patintero. Those days are gone, computer games, gaming consoles, DSs and PSPs replaced the street games. Instead of playing on the streets, they are at home playing video games or inside internet cafes. After deliberating, the team decided SIPA will be the game. Inspired and excited, the creation of SIPA consumed them. This is a breakthrough because SIPA, the Philippine’s national game can now be played using Android based phones and Apple gadgets. Technology has changed the way kids play now but this same technology can help us appreciate games no longer played. SIPA brings back childhood memories and introduces this to the younger generation. On top of this, Butchokoy, the central character plays SIPA in historic and beautiful places in the country like Rizal Park, University of the Philippines, Quiapo, Mt. Pulag. 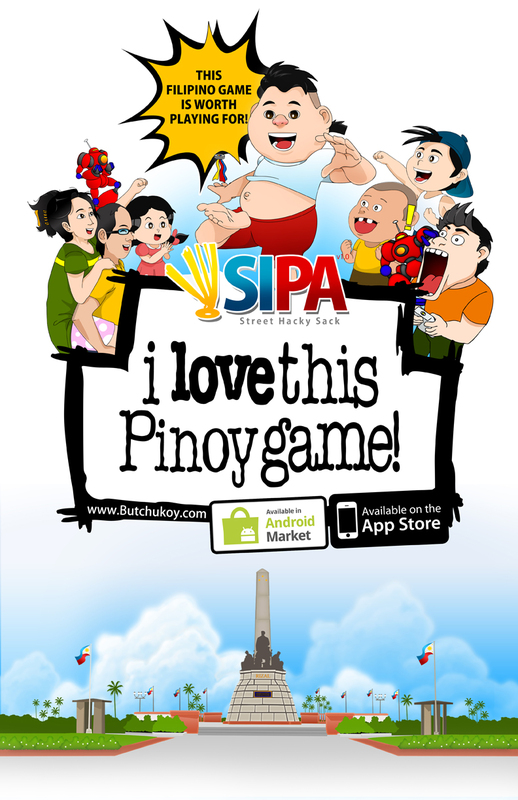 SIPA is not only a game, it was born out of a passion to create a landmark Filipino game in the apps world. Butchokoy is not only a character, he is the kid in all of us who plays, learns, cries and laughs. Team Butchukoy is proud to say that they have faced the challenge and have conquered it. Truly, this Filipino Game is Worth Playing For.